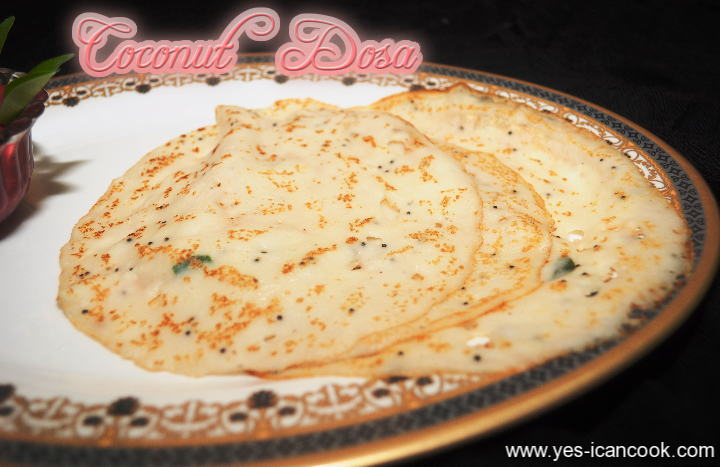 My cousin gave me this recipe for Coconut dosas a few days back and I gave the recipe a try. I liked the taste quite a lot. The batter is easy to prepare and no soaking or fermentation is needed. This is a variety dosa for dosa lovers. It is a soft dosa and doesn't cook crispy. 1. Wash and soak urad daal in some water for an hour. 2. In a mixer add grated coconut, soaked urad daal, green chilli, ginger and grind to a paste using water as required. 3. To the ground coconut paste add all purpose flour, salt, water as required and mix well to form a batter of dosa batter consistency. 4. In a small pan heat oil, add mustard seeds and when they splutter add curry leaves. Pour this over the batter and mix well. 5. Heat a tawa and reduce flame to medium once it is hot. 6. Pour a ladle full of batter and spread either like a thin pancake or like a dosa. 7. Sprinkle or spray oil and let it cook. 8. Flip to the other side and cook.